CRAIG LOWNDES, Jamie Whincup and Toni Vilander have won the Liqui-Moly Bathurst 12 Hour after yet another dramatic conclusion to a Bathurst enduro. The Maranello Motorsport Ferrari trio outlasted the most competitive field the race has yet seen to win – but the dramatic final hour of the race once again provided compelling viewing, as a late challenge for victory by the No. 22 Scott Taylor Motorsport Mercedes AMG GT3 came close to victory but ultimately ended in a non-finish. 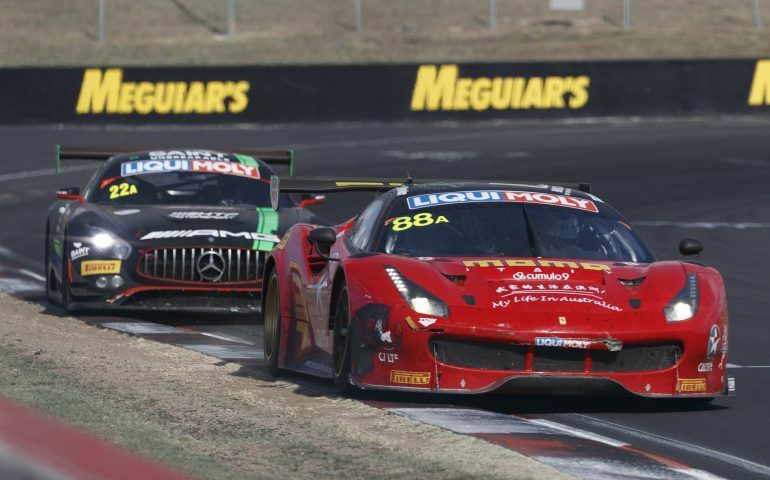 Defending 12-hour winner Shane van Gisbergen emerged in the lead after the final round of pit stops, narrowly heading Jamie Whincup in the Maranello Ferrari by two seconds. The pair then staged a thrilling duel for the lead with Whincup putting two wheels on the grass to pass van Gisbergen down Conrod straight before pulling away in front as the race reached its final 45-minutes. However a late Safety Car within the final 20 minutes re-closed the gap between the pair, only for van Gisbergen to sensationally crash out of the race at the dipper once the race had resumed, denying him, Maro Engel and Craig Baird second place. Whincup then survived a final safety car interruption in the final 15 minutes before bringing the Ferrari home for the brands second Bathurst victory, backing up their 2014 effort. The result delivered Whincup and Vilander their first Liqui-Moly Bathurst 12 Hour victories and Lowndes his second, the winners completing 290 laps – 1978km – of Mount Panorama en route to victory. “It was quite ironic that me and my teammate Gizzy were fighting for the win right at the end there,” Whincup said of battling his Red Bull HRT teammate for Bathurst victory. Added Vilander: “Yeah, you know sometimes you have those days, clear track and just felt really comfortable in the car. Even all the traffic seemed like it was dropping in the right places with the right timing. Lowndes celebrated his second 12-hour victory, adding to his six wins in the Supercheap Auto Bathurst 1000. “I did a lot of the morning shift and looked out for the traffic and brought the car home clean until the restart of my final stint. For me, as Tony said, the car, we rolled it out and didn’t do much with over the course of the couple of days. It was a much nicer car than the 458 over the top of the mountain for both Jamie and I to get familiar with the car. Van Gisbergen’s late race dramas – that also included a looming penalty for contact with a lapped vehicle – elevated the Ice Break Competition Motorsport Porsche 911 GT3R to second place, Marc Lieb, Patrick Long, Matt Campbell and David Calvert Jones delivering Porsche’s latest racer a Bathurst podium on debut. The quartet also won the B.R.M watches Pro/Am class thanks to their sensational performance. Third was the Bentley Team M-Sport No. 17 car driven by Steven Kane, Guy Smith and Oliver Jarvis – Kane and Smith on the Bathurst podium for the second time in two years. The No. 912 Walkinshaw Racing Porsche driven by Liam Talbot, John Martin and Duvashen Padayachee finished a solid fourth outright – and first in the GT3-AM class – after their higher profile teammates in the No. 911 car were out with damage early in the day. Defending champions TEKNO Autosports were unable to back up their 2016 success, though a dogged performance from Come Ledogar, Rob Bell and Alvaro Parente saw the No. 1 car score fifth at the finish. As usual the race claimed high powered combinations early in the running, 24 cars failing to finish from the 52 starters. Noted non-finishers included the No. 74 Jamec-Pem Audi, who crashed at the Dipper on lap six, and the Class B Pole sitting Porsche from Grove racing: out after 32 laps after making contact with the wall at Reid Park. The No. 911 Porsche GT3R of Kevin Estre, Earl Bamber and Laurens Vanthoor had a share of the lead early, however contact with a wall saw broken steering force the car out. The profile Mark Skaife / Russell Ingall / Tony Longhurst / Timo Glock BMW Team SRM M6 GT3 was out after five hours after Ingall hit the wall at the Dipper. Starting from the back of the field after a last minute engine change last night, the 650S GT3 had engine dramas early in the race and dropped two laps off the pace. A stunning charge through the field saw them regain one full lap en route to a solid top five. Dean Grant, Dylan O’Keefe and David Wall won Myplates.com.au Class B, while the No. 19 Porsche Cayman of PRO Sport performance won AVIS Class C.
A tight battle to the line in the Racer Industries Invitational class saw Keith Kassulke, Will Brown and Rod Salmon edge out their teammates by less than 10 seconds to grab the win. Today’s race featured 16 interruptions by the Mercedes AMG C63 Safety Car, seven different race leaders and 23 changes of the lead, at the start finish line. 40,364 people attended the 2017 event, a 9% increase on 2016.